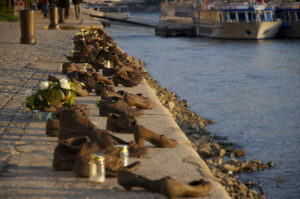 Shoes along the River Danube Budapest are tragic memories of the World War II Jewish executions. The monument is located on the Pest side of the Danube about 300 metres (980 ft) south of the Hungarian Parliament and near the Hungarian Academy of Sciences. Conceived by film director Can Togay, designed and made with the sculptor Gyula Pauler to honor the Jews who were killed in cold blood during Dec 1944 and Jan 1945. Jews were asked to take their shoes off facing the river and shoot to death. The bodies were carried away by the water. The monument represents the moment just after their death when the shoes were still there. Get to know the Jewish Heritage of Budapest and enjoy a dinner cruise with live music. In 2016, Shoes along the river Danube was chosen as the world’s second best public statue. If you wish to explore the riverside, why not join one of the river cruises? Enjoy the daytime cruises or the sunset and the evening lights on board.